Sometimes, we don't need to look for for inspiration too far off from where we stand. While i am often known to be a "School of Hard Knock" kind of guy, wifey do suffer from the constant pushing and the "HTFU" look whenever i train with her. 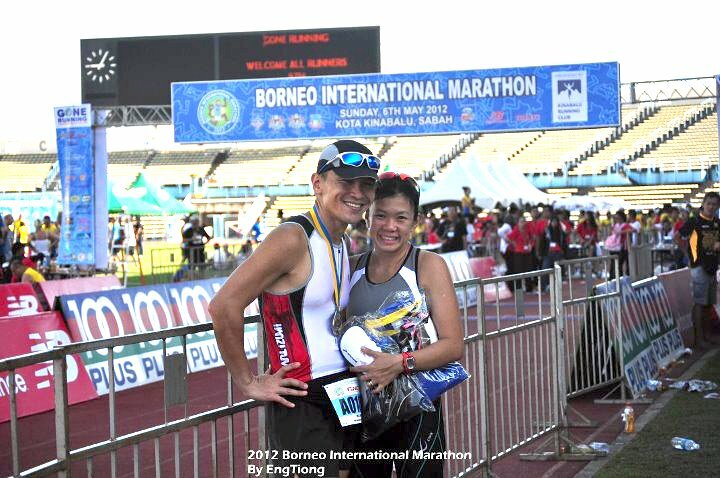 Within the last 2 years, she has progressed from running 10km races to 21km races, and has "graduated" to the 42km run. Journey along the way certainly wasn't easy as she was carrying a lot of post-pregnancy weight from Ryan and Nadia. At her heaviest, she was 75kg (post pregnancy) and now, her weight remain a secret that only her and the scale knows. For those of you that has just started running or exercises to be healthy or to lose weight, here is wifey's journey to awesomeness. For the record, I have finished behind her in all 4 marathons and the last two 21km races we ran together. Recipe for Success. She so gonna kill me for sharing this. To begin with, she never run more than 2km in her life prior to this and she is a true testament of "never say never". With better timing after each run, she has come to realization that running a race is never about timing anymore - but to finish strong and still being able to smile is the main priority. With each race, she went from "limping the next day" to (Borneo) "Shopping the same day!" Shopping at Jalan Gaya Sunday Market, 2 hours after the race finish! There is really no reason for the sudden "urge" that is stronger than deciding to lead a healthier life. With two kids growing up, it is utmost important for wifey and me to provide an "example" to the two precious cargo at home. While some might say (or she will say) it is actually vanity, which is partly true; as nothing will drives you more than your own health and how you will look and fit into your own clothes. While it is easier to buy bigger clothes to fit the body, it would be more satisfying to buy smaller clothes, and finding ourselves being able to fit into something you could never wear for years. Yes. It is about YOU wifey! For someone that has signed up for Karate back in school (as it covers both Uniform AND Sports curriculum activities) and never ran...she has came a long way - and the only way onwards from now is to continue to do what she is doing best now - keep smoking me in races! For those of you that think you CAN'T. Think again and show yourself you CAN! wow, its awesome and she looks great now! and its where i started my first 10k too ..where it all started for me :) we actually finished the same time too hehe .. kudos to Aileen and to you for encouraging her! keep up the good work, both of you! i have my 2009 pic on my fb page! Kak June - we all do things for our own reasons. for every one that is successful, 9 other failed. 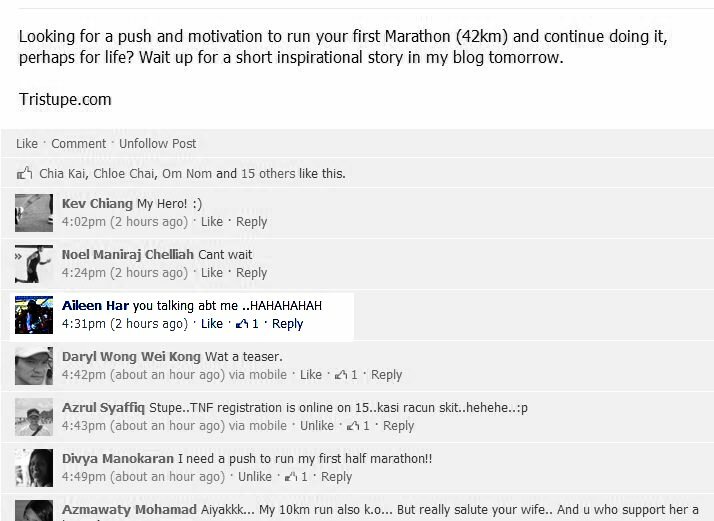 You are an inspiration as well - who else will be dishing out food at KM32 if not you? Teng - you came a long way too buddy. Salute. another good write up!! woo hoo!! a true multi talented women - :) from kithchen to work place to tuition classes :P and on the road!! Happy Mother's Day Aileen!